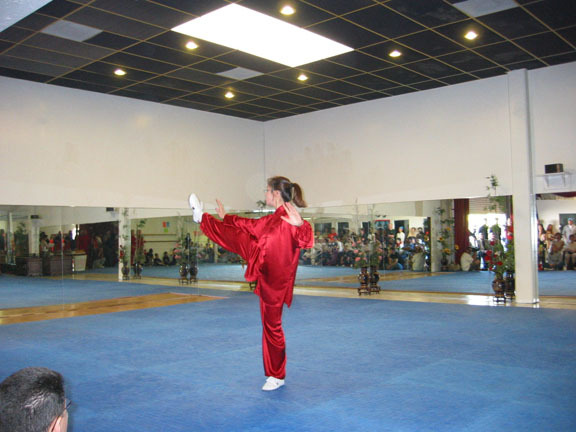 The most admired Kung Fu school in San Diego is JING! The ONLY China certified San Diego Kung Fu school. JING has all the Kung Fu styles: Shaolin Kung Fu, Wing Chun, Traditional Kung Fu or Contemporary Kung Fu & Tai Chi. JING is the friendliest, largest, most powerful and “most beautiful” Kung Fu School in San Diego! *Pictures from JING's 2nd Year Anniversary! Jing Jing has pretty good control of her leg up high. She is honored as "princess of Taiji".